KraftMaid Pinterest Contest: Enter to win a $500 Visa Gift Card! In celebration of our latest products that harken back to heirloom style, KraftMaid kicked off our “Return To Your Roots” kitchen inspiration contest on Pinterest this week! To enter, just complete three easy steps below for your chance to win a $500 Visa gift card. We’re giving away one grand prize per week for the next three weeks (ends August 12)! At the heart of the contest, we want to know what inspires you in kitchen design. From the cabinets and countertops to the dishware and even your ideal location, what does your dream kitchen look like? We will be selecting winners based on creativity, use of KraftMaid products, and your interpretation of the “Return To Roots” theme. Step 1: Follow KraftMaid on Pinterest. 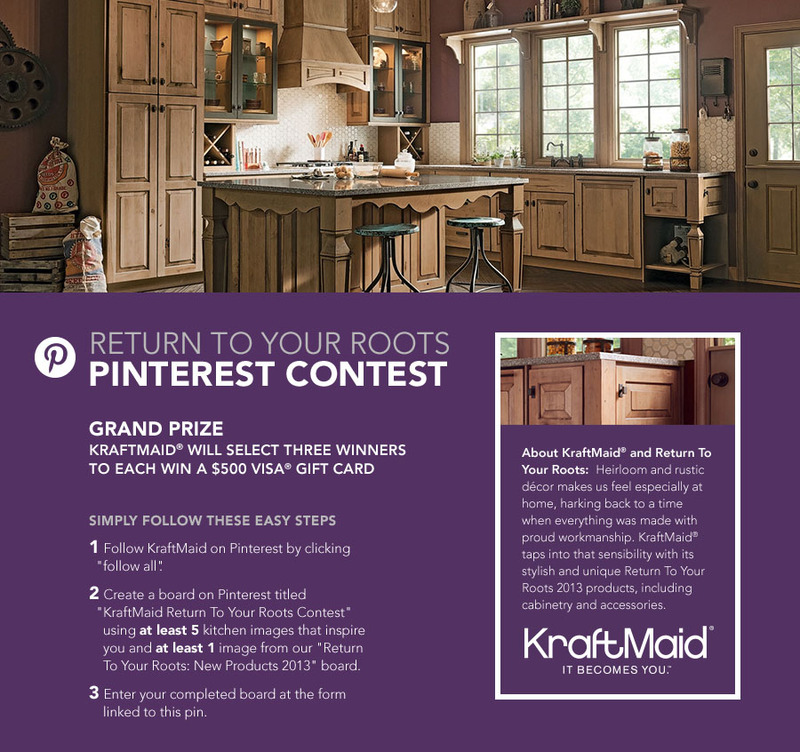 Step 2: Create a board on Pinterest titled “KraftMaid Return To Your Roots Contest” using at least 5 images that showcase elements of your dream kitchen and at least 1 image from our new products board. Step 3: Enter via this form and include the link to your own completed “Return To Your Roots” Pinterest board. So pin your heart out and share with us what inspires you most about kitchen design! Looking forward to seeing your boards! Check out our contest example board to spark your Pinspiration! NO PURCHASE NECESSARY TO ENTER OR WIN. A PURCHASE WILL NOT INCREASE YOUR CHANCE OF WINNING. Promotion ends August 11, 2013 at 11:59 P.M. ET. Open only to individuals who (a) are legal residents of, and domiciled in, the fifty (50) United States or the District of Columbia, and (b) have attained the age of majority in their state of residency at the time of entry. See Official Rules for details. Sponsored by Masco Cabinetry LLC, 4600 Arrowhead Drive, Ann Arbor, MI 48105. VISA is a registered trademark of Visa International Services Association. Visa is not a sponsor of this Promotion.